For our complete range, click on the Boston Promotional Gifts logo in the top left corner; our parent website has literally 1,000's of products to choose from. There is a bewildering array of promotional items around in the market place, and to help you, we have designed this website to be as simple and as easy to use as possible. Our website includes all of the best selling items we sell, with low minimum quantities that many of our competitors will not supply. At PrintedPens we pride ourselves on the quality of our products and services, as we are only as good as our last job. We are working hard to continually improve our service and would appreciate the opportunity to assist you in any way we can. 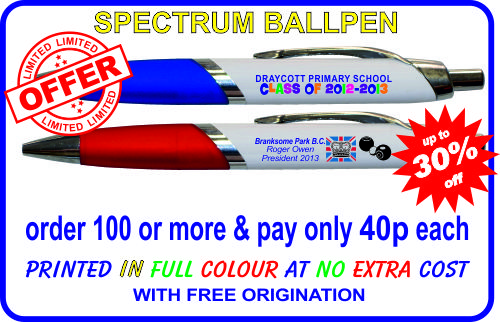 So, whether you want 50 key rings for a wedding or 10,000 pens for a major trade show, we are the people to help. We believe our prices and service simply cannot be beaten, so why not give us a try. If you cannot find what you are looking for, try our parent company Boston Promotional Gifts; simply click on the logo in the top left hand corner of the page.